Clarify 2Additional ResourcesDOCX (Word) Templates IntroductionWhere do I put custom DOCX templates? From the help menu select Reveal Custom Template Folder. This will show the folder where custom templates go. The Templates folder will have a number of folders. 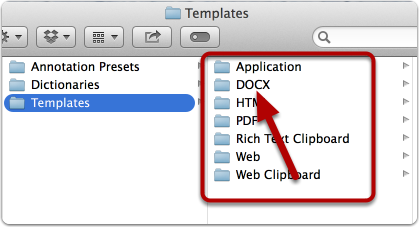 You will put custom DOCX templates that you create in the DOCX folder. Next: How is a DOCX template structured?